Ask fellow campers about "Scenic Beach State Park" and nearby attractions. Folks tethered to electricity and full utility sites are really missing some great camp sites. Scenic Beach offers private, shaded sites that you just can't find other places. Each site is surrounded by tall trees, and an understory of bushes, so you can hardly see or hear your neighbors. It is above Hood Canal, with an equal number of back in and pull thru sites, but as it's in the hills, not all the sites are level. There is a dump site. Also, if you don't have reservations, you need to pay at the entrance which is quite a hike. Even though its an extra $8. I would recommend reservations just for that reason alone. There are a few trails and a small beach within walking distance. I want to go back in May when the rhododendron are in bloom. It must be spectacular. We camped at Scenic Beach State Park in a Motorhome. This is an outstanding campground. There are no utilities in the campsites, but there is potable water and a RV dump station. 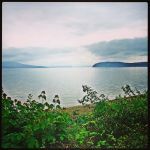 The camp is located on the north end of the beautiful Hood Canal. During clear weather, the rocky beach has a spectacular view of the Olympic Mountains. The campsites vary from private to very private. Our site was totally private and deep in the lush dappled sunlight of cedar and fir trees. There are two good playgrounds for kids. Many sites are small and somewhat uneven, but they work for small and moderate RVs. Pull-through sites would fit all but the largest bus type RVs. We were there on Memorial Day weekend, and the campground was full. Fellow campers were generally quiet, and all noise was done by 10 PM. I would happily return. We camped at Scenic Beach State Park in a Travel Trailer. The beautiful Victorian seaport of Port Townsend is about 45 minutes away. Hurricane Ridge is about 90 minutes away. There is golf and dining in Port Ludow. A general store in Seabeck has firewood. Are you affiliated with Scenic Beach State Park ?